I bought a couple used LTFLU from ebay thinking that if they are good enough for the Fluke, they are good enough for me They should arrive within a week. Now I have been searching to see what I can find out about the LTFLU reference zener. As some know I'ts a custom Fluke component from LT and used in some of the very best voltage standards like the Fluke 732B. The part was never sold to end users. While digging in to the documentation, mostly the for the 732A, where there is a schematic and BOM, I realize a few things. While the LTZ1000 docs are not the best, for the LTFLU they are almost non-existant. The LTFLU has the temperature compensating transistor in series with the diode, not parallel as in the LTZ1000. The LTFLU is in a 4-pin can, the LTZ1000 in an 8-pin. They are far from drop-in compatible. A schematic for the LTFLU circuit is available in the 732A instruction manual, page 8-11 (93), figure 85, part U2. Available for download on the net. I don't know if it's identical to the 732B, I have not found a schematic for the reference board of the 732B. As far as I know the 732B was improved over the A, by placing more of the critical components in an oven and the B model also has better current compensation for the zener. IMO, there are two main problems with making a voltage standard circuit. To amplify and trim the reference to 10.000000V and keeping it stable. The second is much more difficult than the first. I'ts now obvious to me that it will be more complicated to get good results with the LTFLU than with the LTZ1000, so why bother? I'll quote what I heard in an interview with a guy who's interest in life was old English sports cars, on why he liked tinkering with them: "They give you such interesting problems to solve!". I guess it's the same with me. I guess there could also be interest from 732 owners on understanding the inners of this circuit. As soon as the mail arrives I will throw the parts on a good SMU and get some basic characteristics. Does anybody have a pin-pout? Yes, I should have searched the info before buying the components. By the way, I don't know if the LTFLU and SZA263 are identical or not. I attach a copy of the LTFLU section from the 732A datasheet. I have started cad-ing the schematics of the reference board. There is an auction that shows a LTFLU-1 installed in a Fluke 8842A. I noticed this a while ago but did not think it was the same part. It would be interesting if a member here had one that could verify that this is authentic. I haven't seen anyone mention this previously. The date code appears to be 1989 and the other surrounding parts are from 1991. It could be that these meters are the source of some of these LTFLU references. I think he also had some SZA263 but it seems the shop is closed now, vacations in China. First part of the schematics around the LTFLU on the 732A. Not completed! Working on it now and then. E24-E25 are interconnected via 51R R26 and E27-E28 via 51R R64. Several other components are somewhat exotic / obsolete. Almost all resistors on this schematic are selected / matched / marked "Return board to Fluke for repairs", no specs and sometimes no value given. Did you buy a complete "RefAmp-Set" including the trimmed resistors or only the zener. I think without appropriate resistors you will have much fun to find out how to trim the tempco. And here is the reference schematic form the 8842A manual. The adjustment is done by supply the reference and the resistor network as a matched set. Nope, no complete set, just the LTFLU ICs. Even with the Amp set, which contains two resistors R5 and R9, there seems to be a ton of trimming to be done. I'm sure these will keep me busy for a while. Jay_Diddy_B, thanks a million! This seems a lot more straight forward than the 10V implementation of the 732. If you happen to have access, it would be great to have some values for the unmarked resistors R701 and two Z701. Would be a lot of help! 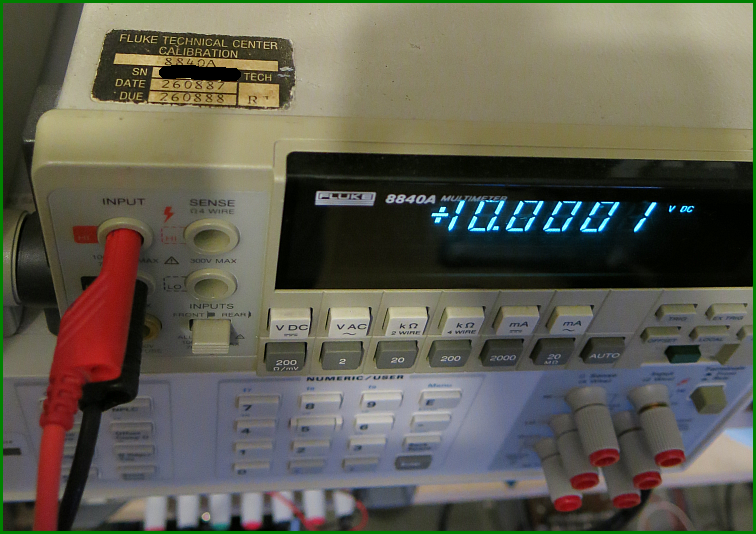 I wonder what they mean by -0.05V near Z702 / 3K2 on the base of U701? I just downloaded the 8842A manual. It has the BOM and schematic, but of course no values indicated for the ref set resistors. Are any of those exotic divider resistor chip with two resistors physically "interwoven" to ensure ratio tracking? I measured the values of the unknown resistors, But I think that there is more to these resistors than shown on the schematic. I suspect that the top of Z701 may be a divider. I measured 5.081K from pins 1 to 2 and 0.7983K from pins 2 to 3. But I do not get the correct operation in my LTspice model. 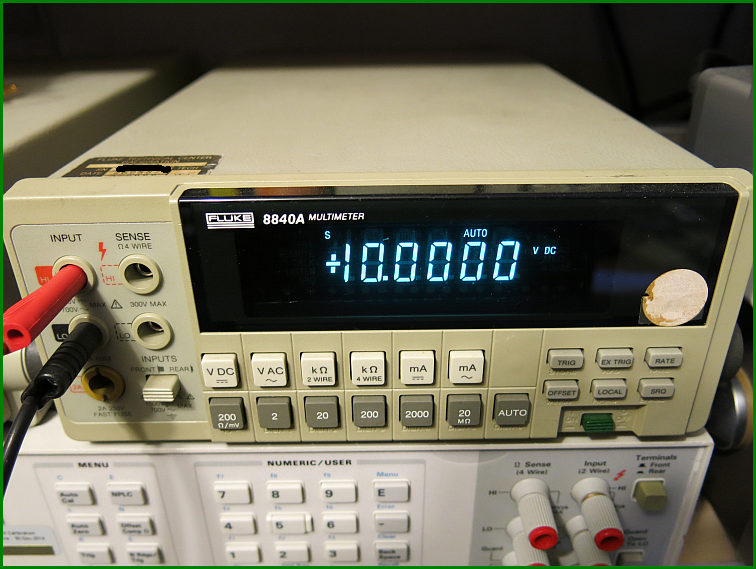 If I use 0.07983K then I measure the same voltage in LTspice as I do in the unit. I have attached the LTspice model if you want to play along. Im missing the 4.445 K resistor in your model. And the LF411/412 are J-FET amplifiers with low input bias (e.g. like LT1022 but not LT1013). (dont know if this matters). With the 4.445K resistor and changing R7 to 20K I get near +/-7V at room temperature. I've also used the 6.2V zerer which may of course be wrong. I'm wondering what the 20K divider is. The ratio would have to be "ppm perfect" and stable as anything. The 20K resistors are part of the larger resistor module(Z702). The smaller resistor module is the Z701. Fluke engineers placed these so they are in thermal contact. I may have a 'parts unit' 8842a that I am unable to repair. I will look for it later. I have attached a pdf with the Fluke 431B schematic. It uses a reference similar or the same as the LTFLU. The manual says that R13 is selected to set the tempco. R9 trims the output voltage. This gives a clue as to how the LTFLU chips should be trimmed. This is a heated reference. The heater is on the die, similar to a LM399. The heater is fed with constant voltage and the heater is a non-linear PTC that controls the temperature. A1 is a 723 voltage regulator. My fluke 8840 also has a SZA263. The difference between the 8840A and the higher specification 8842A is the quality of the resistor used in the reference circuit. The catalogue talks about higher accuracy and longer calibration cycles. The blue resistors in your 8840a versus the hermetically-sealed, white resistors in the 8842A. Here a verry happy owner of two Fluke 8840A DMM's. My first fluke 8804A multimeter I bought in 1986. This is the 8840A from 1987 He never been calibrated after 1987. Jumpt one digit, i switched of my voltage reference and it was not completely finished after turning again. So it will definitively go wrong: 1990 the definition of Volt has changed by 9.264 ppm. One thing; the parts I have bought are four-pin, so there can't be any heater in the can like shown in the 335D schamatics? Do you not think it's great that this instrument is still as accurate after nearly 30 years? I know about the change, but thanks for the document! 10PPM is one digit in this instument, far below its specs. don´t take it that serious: I only forgot the "irony punctuation". Of course its a very good long term stability for any device. that had the precision to get the KJ90-sticker in 1990 after calibration. (re-adjustment). Fluke ended up partnering with Linear Technology, and they designed the LTFLU-1AH [there was never a non-'A' version]. This is a mistake. There are both 'A' and a non-'A' versions of the LTFLU-1.